In an absolutely stunning move, HP announced today that it plans to "discontinue operations for WebOS devices". They specifically refer to the TouchPad and WebOS handsets. According to the brief mention in the press release, HP claims that they will "continue to explore options to optimize the value of WebOS software going forward". As an initial response, I feel that this is a knee jerk response to the lackluster worldwide response to the recent crop of WebOS phones (Pre 2, Veer, Pre 3) as well as the TouchPad tablets along with Monday's announcement of Google acquiring Motorola Mobility. My guess is that HP will choose to either aggressively court licensees to produce WebOS hardware or they may look to shift the platform to embedded devices such as printers and as an secondary "instant-on" OS for their PC line. No word as of yet how this impacts the imminent launch of the TouchPad 4G, the 7" TouchPad Go line or the Pre3's domestic release. In related news (and in the same press release), HP has also announced that they are exploring spinning off their Personal Systems Group, the group that includes HP PC hardware business and whats left of the former Palm Inc.
Well folks it's the day the music died. HP announces that the plug is pulled on the last vestiges of Palm. What a fun ride it has been. The end came even faster than I expected. Nice work HP ... Not. RE: The Day the Music Died! When I had a Vx and the m505 was about to be released I would have never, ever expected this to happen only a decade later. Due to the significant price reduction, we experienced overwhelming demand for the product and are temporarily out of inventory. Please enter your email address below to be notified as soon as we have them back in stock. We have received unprecedented orders as a result of the tremendous discount offered. This is clear confirmation to HP there is huge interest in building a webOS community. We apologize for any difficulty you may have had in ordering on the web or through the phone this weekend; it was as a result of selling out of our current inventory. Your order has been captured and you should receive a confirmation over the next 48 hours. Additionally, some of our customers may have experienced a pricing error while purchasing on August 20th and 21st. We are in the process of ensuring every order is honored at the discounted price and will send you confirmation via email. Should you have any questions, we can be contacted at 1 800 888 5858 option 1: Though we are expecting significant call volumes with extended wait times over the next 48 hours, we ask for your patience and we are committed to our relationship with you and to delivering the best technology solutions for you and your business. What's going to happen to PalmInfocenter? I'm not going anywhere unless Ryan is! We survived the many deaths and near-death experiences of Palm/PalmSource/Palm0ne/Handspring...what's another abandoned platform!!?! What a shame....the Palm PIM is still the best. Still taking this all in here. I can say that in the short term of course PIC will stick around to chronicle the results of todays news. We've been covering the Palm scene since '99 and may just continue to do so for at least a little longer. Personally, I am still continuing on with my other web businesses at MobileInfocenter. In addition to PIC, for the past year I have been developing and releasing iOS apps and maintaing my news aggration sites. I'm still working on hitting the app lottery but if you have an iPhone or iPad checkout my stuff in the App Store. You can find all of my apps by searching for "MobileInfocenter" (no spaces). Thanks for the ride Ryan. Good luck developing. I hope at least one goes exponential for ya. Seriously LiveFaith...I had that same title in my head before clicking over to the comments. There is simply no reason for this to have happened. Palm once rocked the world with the Tungsten lineup...no competition. Then, it all began to decline. Me and my kids all use iphone and ipads. But, I pulled out my T2 the other day and my 7 year old was wowed..."What happened," he asked. What happened in deed. I'm am saddened today. So much potential wasted. Not surprising, but shocked at the speed of the decision. Perhaps this site should be re-branded for generic mobile hardware/software reviews. Getting rid of the Palm name was dumb, dumb, dumb. Nobody saw the HP name as a credible tablet/phone/handheld device maker. Perhaps they'll spin off WebOS with the Palm name again, but then again, Palm was "only" 8 years too late with a new OS to replace FrankenGarnet. RE: Getting rid of the Palm name was dumb, dumb, dumb. I hope they SELL it. HP is utterly bumbling, fumbling, foolish, and untrustworthy. They are not decent enough to let it go open source or donate it to the WebOS Internals group. Their conference call happening now, reveals they are 100% committed to WebOS' future. They are liars. Nonetheless, they will probably sell it or make a worse decision to license it. The company who legacy is gigantically buggy and bloated printer drivers has no business trying a software war with M$ and Goog. At this point (post Palm, post HP) it needs to be put out to pasture. Honestly, I'm not shocked at all. One: HP has a historically terrible record of handling mobile devices. They tend to be either badly engineered, or quickly abandoned, or both. You'd be hard pressed to name a really unqualified success that HP has had in the mobile space in the last five plus years. Two: WebOS was a dead man walking beforehand. Sorry folks, but it never had the cachet to overcome the fact that Apple and Google are the two big platforms. There's little to no room for anyone else unless you have an approach as revolutionary as Apple's and Google's were when they debuted. WebOS not only wasn't in that ballpark, it wasn't even in the same sport. Three, the HP TouchPad just wasn't a very good product. Next to nobody was going to buy it when they could get an iPad, a Xoom, or a Galaxy Tab for the same price. And last but not least, WebOS isn't going to be licensed to anyone else. Nobody is going to want to touch in this climate, doubly so after this has happened. RE: Honestly, I'm not shocked at all. Actually I could see HP selling palm's patent portfolio and raising a decent chunk of change. HTC, Samsung, Google, or Apple could be potential buyers. HTC/Samsung - an alternative to android and Microsoft. Google/apple - patents and integrate aspects of webos into their respective operating systems. -HP sells the rather vast Palm patent portfolio to one of the parties mentioned by jca666us. But it could really be to any number of firms with $ to spend and a bit of paranoia. In this wild time of frenzied IP-related licensing and acquisitions, now is as good a time as any for a beleagured firm (HP/Palm, Kodak etc) to make a few bucks. -HP sells the "Palm" brand to some relatively no-name Asian firm,such as ZTE, Huawei etc for use on low-end Android smartphones. "Palm" becomes another one of the "walking dead" CE brands such as Philips/Magnavox, Emerson, Westinghouse, Polaroid, Sharper Image etc. -HP will release the TouchPad 4G in VERY limited quantities domestically. The 7" version will be canned at the 11th hour, or perhaps released as a wi-fi only device in extremely limited quantities (however many they have currently produced and have sitting in a warehouse somewhere). -The Pre 3 will make its rounds overseas on a handful of carriers but not see an official US release. A shame, as it actually like a surprisingly decent little device. I see it ending up like the 128mb Centro, a seldom-seen but solid little device that was too little, too late. The entire remaining inventory of TouchPads will be blown out around the end of the year or early 2012 by Cowboom or Woot. I wouldn't be surprised if the Pre 2 and Veer have already been discontinued. -HP will likely cut the WebOS team down to the bone and keep it around for another 6-12 months as it frantically seeks a buyer or licensee, maybe pumping out a few more minor TouchPad OS updates and bringing out a few connected printers, PCs or maybe a digital photo frame to market with "limited" WebOS functionality since those are probably already in production for the holiday season. After the end of this year, I see HP getting desperate and selling WebOS for pennies on the dollar it to another firm with rather strict guidelines in place for how WebOS can and cannot be used. It will die a slow, gruesome death, kept alive by a few diehards and the Preware folks. Open-sourcing it would make too much sense. Perhaps Access wants back in? -This is too big to be kept under wraps for long. I expect ALL SORTS of juicy "tell all" insider reports from disgruntled employees. Maybe some good stuff from the final days of Palm will be unearthed too. Perhaps now we will find out why Rahul Sood and company initiated the mass exodus from HP over the past year! P.S. Adama brings up a superb point about HP's horrible track record with consumer products. They had a series of cheap-o cameras over the past decade that were always decent but very uninspired designs. Same goes for their digital photo frames and their short-lived flat panel TV line. Really, nothing from HP has excited me in a years other than some of their higher-end printers, scanners, monitors and a handful of memorable PCs (the first Envy machines and the awesome Blackbird). The question is, I think, what patents does HP have left over from Palm that would really have any value? Dozens of companies are building very successful smartphones without any of said patents, and Palm hasn't had truly revolutionary new style of device that they had a lock on for many, many years. So why does anyone really need to buy out their patents? Out of what hkklife outlines, my personal suspicion would be HP selling just the Palm brand to a firm that does generic hardware. HP's certainly not going to be using it, and it would be a good name to slap on some otherwise generic Android phones and tablets. So the Palm name might live on, albeit divorced from anything to do with the original platform. ....in business schools as a classic case study of a company with spectacular leading edge ideas that was completely incapable (after a point) of turning those ideas into a market-dominating product. The seeds were sown for what happened today back more than six or seven years ago when Palm failed to get any OS past Garnet out into handsets. It just kept recycling the same idea in different form factors (Treo 600, Treo 650, Treo 7xx, Centro, Treo Pro.....) and didn't get a radio out that could do more than bluetooth and cellular until way too late. By the time Palm announced it's "next great thing," the Pre, it was way too late. Apple already owned the marketplace and WebOS was already an also-ran. Now that Android has come on the scene, WebOS is completely irrelevant, and the handsets are completely inadequate. The developers have fled to Android where things can happen in a matter of minutes if not hours. For instance, when the latest over-the-air update to Gingerbread for the HTC Incredible (a handset already end-of-lifed by Verizon) was released this past Monday, the developers were all over it and by Wednesday there were already 3 flashable ROM versions for rooted Incredible users. Palm developers used to generate that kind of excitement. I remember the big fuss when Garnet 5.0 came out. Contrast that with the yawn generated when the HP Touchpad came out. There hasn't been anything remotely resembling "excitement" on this platform in way way too long. I look forward to Ryan and the good folks at Palminfocenter putting their efforts forth in other ways. Well said. Few companies have squandered as much momentum and goodwill as Palm has. Their refusal to innovate killed them in the long run. They had so much time to create the mobile revolution. They could have made the iPod Touch. They could have made the iPhone. But for years, they were so recalcitrant. Sad. Palm was killed by Bill Gates. He bought Palm in 2005 and stopped any development on it that would compete with his products. The spinoff WebOS that attempted to carry on with loyal Palm users was not given any attention because the end plan was a Microsoft base smartphone. That doesn't seem to be working for Microsoft either. AllThingsD... 250,000 setting on Best Buy shelves. They're pissed. If they have a fire sale for $99 I'd buy one. I think I would too, or wait to see what shows up on ebay. They wanted to put a dent in iPad & Android sales, well this might do it if they are dumped cheap enough! Dang. I'll get one for $99. Be a great surfin' slate to leave around for the kids to play with. Buy one get one golden-threaded suit free? They'll sell like hotcakes... in the Sahara! Newsflash: as per PreCentral, they're blowing the Touchpads out starting at for $99 for the 16 GB model. eBAY will have the 32gb for $99 soon thereafter. Killer couch web tablet IMO at that price. Pull the plug after 2 months of release. How the f** do you pull the plug so quick? And to think that Microsoft has been working on Windows CE/Mobile/Phone for 15 years and still cannot elevate it above the "crap" stage. I'd guess the problem was giving Rubinstein too much leeway after the acquisition. There was no cohesive business plan - and too much of a delay in releasing new hardware. A better form factor for the touchpad and better performing OS and this could have taken off. I keep reading everyone saying how great webos is/was and in the few times I played around with it, I thought the UI looked good, but the user experience wasn't all there - the big downside is the os performance. I see licensing as a no-go, they need to find a prospective buyer for webos and all of the palm patents. I bet the sale of the patents could more then pay for the 1.2 billion hp paid for palm. I don't think Palm patents are worth much any more. In today's technology Apple seems to hold the patents that matter and they are actively suing everyone ( maybe HP got a notice as well). As far as HP pulling the plug, a good lawyer could probably put together a nice class action lawsuit for the couple dozen people enticed into buying a TouchPad then left in the cold. "Pull the plug after 2 months of release. How the f** do you pull the plug so quick"
Honestly, when you realize you're at the bottom of a hole, digging deeper isn't a very good idea. The products weren't selling; the platform was losing ground; developers weren't coming around ... it's hard to fault the logic that says, "let's cut our loses." This last bit of half-assedness is probably the only moment of sanity HP's management has had through this whole sorry mess of an acquisition. I STILL think Rubinstein is secretly answering to Jobs and was planted inside Palm to take the company down from within. In hindsight this guy has been as big of a disaster for Palm/HP as Yankowski was for Palm over a decade ago and Sanjay Jha was becoming to Moto before Google bailed them out. -Letting the strong Centro branding/product die on the vine with no transitional device from Garnet to WebOS. As I said back in 2008 or so, Palm could have easily and affordably taken the best bits of the 128MB Centro, put it in a sleek Treo Pro-style case, made a few cosmetic tweaks to Garnet and started the "River Stone" aesthetic off prior to the Pre. Just look what little ol' TealPoint software was able to do for Garnet with TealOS or, even earlier, what Saguaro did on Garnet! -Sprint had WebOS exclusivity FAR too long. The mobile landscape shifted immensely between CES 2009 and the arrival of the Pre Plus on VZW a year later (Moto Droid, iPhone 3GS etc). -Lack of a non-phone WebOS device. Even an uninspired wi-fi only WebOS "Pre Touch" would have let users not on Sprint and/or overseas experience the ease and beauty of WebOS for themselves. -Lousy hardware specs, from the Pre to the latest TouchPads. -Mind-boggling decisions to continuously omit certain features from WebOS--STILL no support for expandable storage. Support added for virtual keyboards, voice dialing, and Bluetooth HID devices only very recently. After 2+ years, STILL no native capability to create or edit office documents. I was able to do this on my Palm Vx in 2000! We're a PDA company! No, we're a Windows Mobile licensee! No, we're going to offer a Cobalt product! No, we're comitted to Palm OS Garnet! No, we are going to go with ALP! No, we're going to bring out the Fooleo! No, we're going to do our own OS! We're Palm! No, we're Palm0ne! No, we're Palm again! We are standardizing on SD! No, it's miniSD! No, it's actually microSD! No, actually we are going to go with internal storage onlY! We're aiming for the fat middle of the market! No, we want to target 3D gaming! No, we want to target our extensive line of enterprise customers with WebOS! No, we want to put WebOS in every printer and every PC we sell. We're aligned with Sprint! No, we want to be on VZW! No, now we are in cahoots with AT&T since they are losing the iPhone exclusivity! No, now we want to finally release a wi-fi product at retail since no carrier will have us! We are doubling down on WebOS! No, we did not buy Palm to be in the smartphone business! We will "make things right" for our early adopters! No,we'll just cut the price! We will launch new products domestically! No,we'll launch them in Europe first as "soft launches"! No, we will just let consumers do our marketing for us and keep saying "in the coming months"! July 1st is the TouchPad release date! No, it's actually on July 17th when you will see the big push begin! We are bringing out a TouchPad 4G, a 7" TouchPad, and the Pre 3! 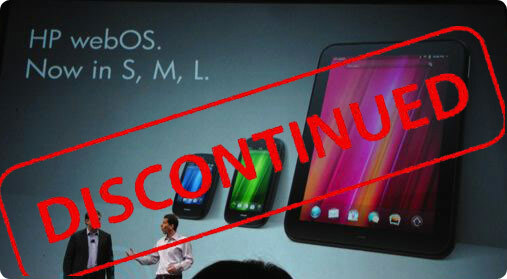 No, we are discontinuing all of the WebOS hardware! You got the picture 100% Kris, a bunch of idiots with something great and not a clue of what to do with it! Gary, I am closer than I have ever been to buying an iPad2! Honeycomb is really NOT satisfying it for my tablet needs at all! P.S. Android UI is horrible. WTF happened with Matias Duarte and the UI revolution he was expected to lead at Android? Bupkis, baby. Bupkis. Give me a BlackBerry PlayBook (best hardware of any tablet) priced at $350 and I'll consider dipping a toe into the hype-filled tablet waters. Oh wait a minute. Did you say Windows 8 $400 tablets coming "real soon now"? Nevermind. Blowing out the (T)ouchPad™ at $300 is all good, but doesn't change the fact that the device is a big, heavy, plasticky, poorly-made (ever seen a WORKING display model?) piece of crap. "The Pre of tablets" - and I don't mean that in a good way. $150 unlocked Veer? Bring it on! Veer = the new Centro (bargain stealth phone). I suggest selling a CondomCovered Colligan special edition (T)ouchPad™ autographed by "Fast" Eddie C and his nasty band of boy toys. "We've learned and struggled for a few years here figuring out how to make a decent phone. PC guys are not going to just figure this out. They're not going to just walk in." Yes, Honeycomb is pretty disappointing. It makes a horribly inefficient usage of the large screens and high resolutions. I also cannot understand why there are such drastic performance and reliability variations from device to device when they are all running (nearly) identical Tegra2 SoCs! Matias Duarte has NOTHING on Rob Haitani and the original Palm OS crew! It's stil a model of simplicity and efficiency. As far as I am concerned, Honeycomb takes a step back in nearly every way from Android 2.x and below, at least as far as intuitiveness and the overall UI. Personally, I absolutely love love love my Galaxy Tab 7" 16GB GSM tablet. It's thin, light, easy to handle, and has superb battery life. Gingerbread is FINE for that particular device and all of the bad reviews for it were done last year when it was running an early, unoptimized Froyo build. Samsung's official GB update helped matters drastically and some of the available ROMs such as Overcome make it an astounding device. It has a solid camera and has better expandability than the 10.1" Galaxy Tab. I also like the Asus EEEPad Transformer. I will probably dump my Acer and stick with the 7" Tab for the forseeable future or at least until Ice Cream Sandwich appears on a solid 8" tablet. I will give you the solid PlayBook hardware but its lack of built-in functionality and add-on apps is simply pitiful. I think it's a solid 2nd or 3rd place in 7" tablet formfactors, behind the Galaxy Tab and maybe the HTC Flyer (ugly in white but comfortable to hold). I think Windows 8 is going to leave a LOT of people pleasantly surprised.